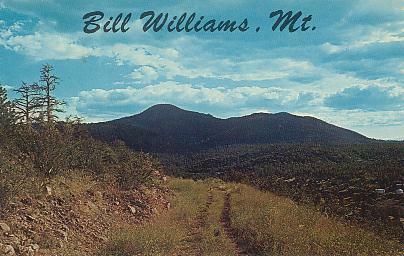 "Bill Williams Mountain. Williams, Arizona. ...This stop on Hwy 66...". Color chrome-style printed postcard. Published by Bradshaw Distributing Co., Sedona, Arizona. Number S-59591. Unused. Copyright 1965. "Looking towards Bill Williams Mountain. West of Williams, Arizona". Real photo postcard. Published by Lollesgard Specialty Co., Tucson, Arizona. Printed by Frashers Photos. Number X708. Unused. Circa 1940s. 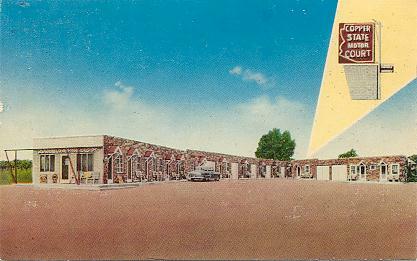 "Copper State Motor Motel. Ash Fork, Arizona. ...". Color chrome-style printed postcard. Published by MWM Co., Aurora, Mo. Number 20,736F. Unused. Circa 1950s. 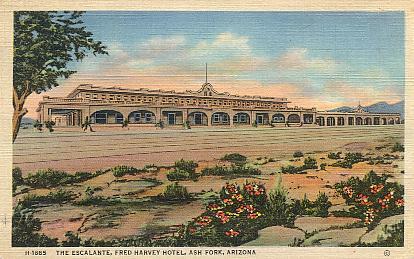 "The Escalante, Fred Harvey Hotel. Ash Fork, Arizona. ...". Color linen-texture printed postcard. Published by Fred Harvey. [Probably printed by Curteich]. Number 7A-H645. Number H-1885. Unused. 1937. 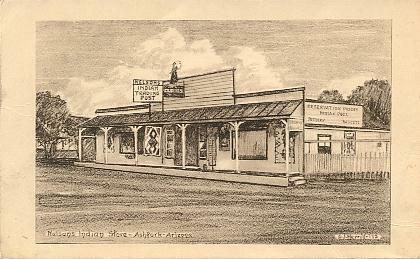 "Nelsons Indian Store. Ash Fork, Arizona. ...". 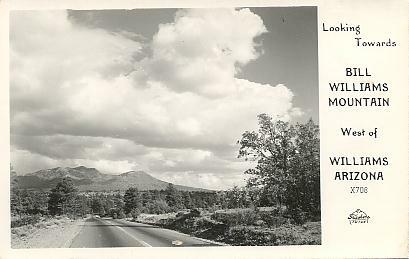 Brown printed postcard. Published by Arthur J. Merrill, Taos, New Mexico. Printed by The Collotype Co., Elizabeth, N. J. Number 132. Unused. Circa 1940s. 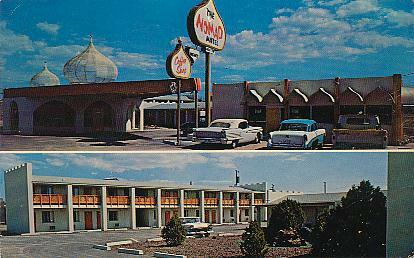 "Nomad Motel. On U.S. Hwy 66, west side of Ashfork, Ariz. ...". Color chrome-style printed postcard. Published by Phoenix Specialty Adv. Co., Phoenix, Ariz. Number 33607. Postmarked 1964. "Court Unique. 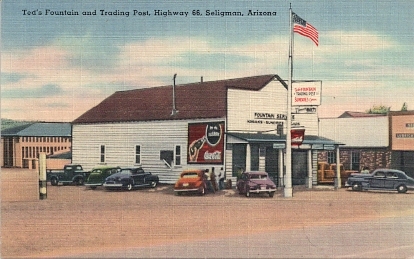 U.S. 66, Seligman, Arizona. ...". Color linen-texture printed postcard. Published by Colourpicture, Boston, Mass. Number K3733. Unused. Circa 1940s. 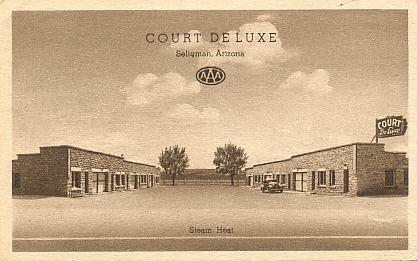 "Court de Luxe. ..on U. S. Highway No. 66 at Seligman, Arizona. ...". Sepia color printed postcard. Published by Asco, Oakland, Calif. Unused. Circa late 1930s. 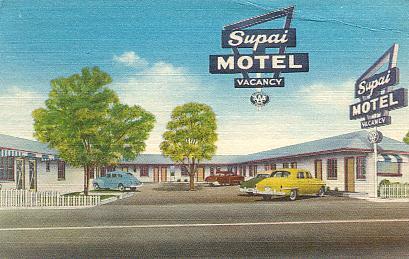 "Supai Motel. Seligman, Arizona. ...In center of city on Highway 66. ...". Color linen-texture printed postcard. Published by Lynx Products, Salt Lake City, Utah. Number 18,233F. Postmarked 1958. 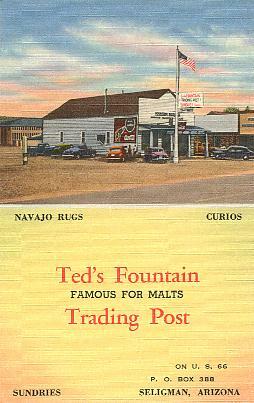 "Ted's Fountain and Trading Post. Highway66, Seligman, Arizona. ...". Color linen-texture printed postcard. Published by Tichnor Bros., Boston, Mass. Number 78227. Unused. Circa 1940s. "Ted's Fountain Trading Post. On U. S. 66, Seligman, Arizona. ...". Color linen-texture printed postcard. Published by Tichnor Bros., Boston, Mass. Number 80564. Unused. Circa 1940s. 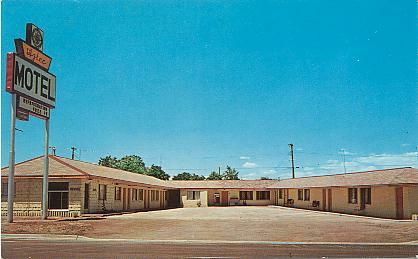 "Navajo Motel. Highway 66, Seligman, Arizona. ...". Color linen-texture printed postcard. Published by Lynx Products, Salt Lake City, Utah. Number E-14691. Unused. Circa 1940s. 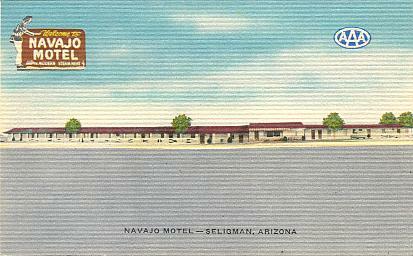 "Navajo Motel. On Highway 66 West, Seligman, Arizona. ...". Color chrome-style printed postcard. Published by Tom Reed, Phoenix, Arizona. Printed by Dexter Press, West Nyack, New York. Number 14568-C. Unused. Circa 1950s. "Aztec Motel. ...on U.S. Hwy. 66 in Seligman, Arizona". Color chrome-style printed postcard. Published by Tom Reed, Phoenix, Arizona. Printed by Dexter Press, West Nyack, New York. Number 14569-C. Unused. Circa 1950s. "Kerbys Auto Camp. 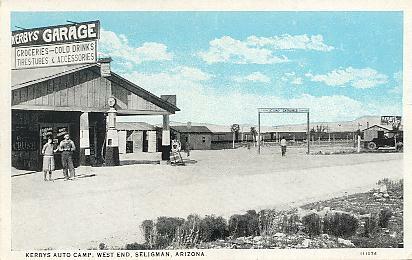 West end, Seligman, Arizona". Color printed postcard. Published by D. T. Mallonee, Phoenix, Arizona. Printed by C. T. Co., Chicago. Number 111076. Unused. Circa late 1920s. "Barns, corrals and house at Tovrea's Double O Ranch. 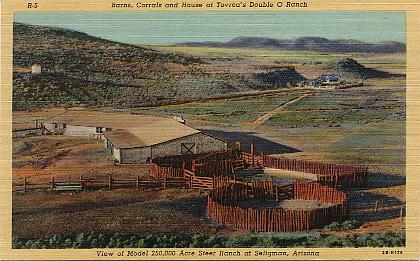 View of model 250,000 acre steer ranch at Seligman, Arizona". Color linen-texture printed postcard. Published by Lollesgard Specialty Co., Tucson, Arizona. Printed by Curteich, Chicago. Number 2B-H176. Number R-5. Unused. 1942. 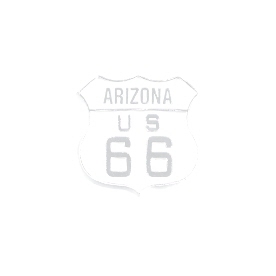 [U. S. 66 runs along the edge of this ranch northwest of Seligman]. 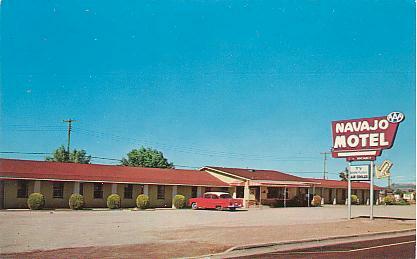 "Park Motel. Dinosaur City, Arizona. At the entrance to fabulous Grand Canyon Caverns on Hwy. 66, ...25 miles west of Seligman, ...". Color chrome-style printed postcard. Published by Ray Manley Commercial Photography. Number 45949. 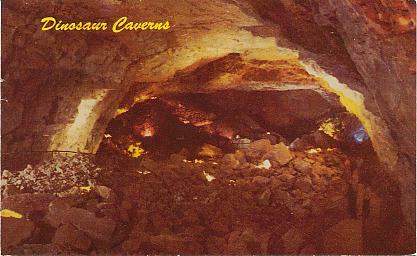 Postmarked 1965, Dinosaur City, Ariz.
"Dinosaur Caverns. 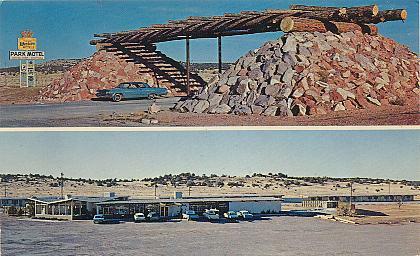 ...on Route 66, twenty-two miles west of Seligman, Arizona, ...". Color chrome-style printed postcard. Published by Petley Studios, Phoenix, Arizona. Number C13302. Unused. Circa late 1950s. 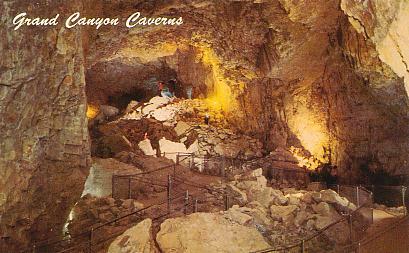 [This is now named Grand Canyon Caverns]. "Dinosaur Caverns. ...on Route 66 west of Seligman, Arizona, ...". Color chrome-style printed postcard. Published by Phoenix Specialty Adv. Co., Phoenix, Ariz. Printed by Henry McGrew Printing, Kansas City, Mo. Number 22987. Number A-85. Unused. Circa late 1950s. 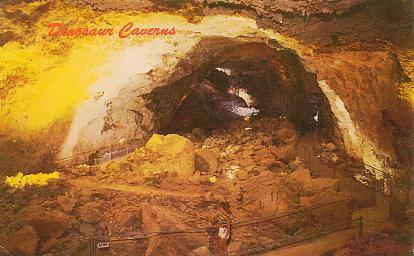 "Dinosaur Caverns. ...on Route 66 west of Seligman, Arizona, ...". Color chrome-style printed postcard. Published by Petley Studios, Phoenix, Arizona. Number C13301. Postmarked 1965. 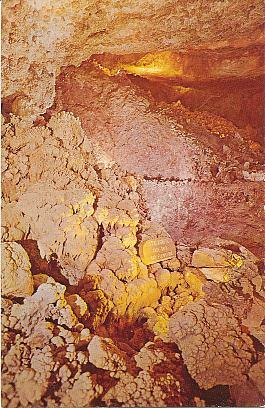 "Grand Canyon Caverns. Dinosaur City, Arizona. ...on Route 66 west of Seligman, ...". Color chrome-style printed postcard. Published by Petley Studios, Phoenix, Arizona. Number C13300. Unused. Circa 1960s. 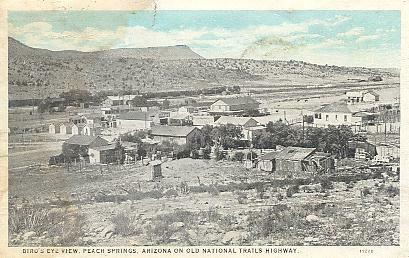 "Bird's eye view, Peach Springs, Arizona, on Old National Trails Highway". Color printed postcard. Published by D. T. Mallonee, Phoenix, Arizona, for Peach Springs Garage, Peach Springs, Arizona. Printed by C. T. Co., Chicago. Number 11220. Unused. Circa late 1920s. 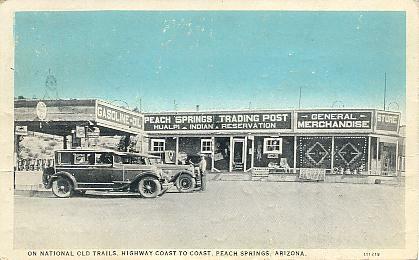 "On National Old Trails Highway coast to coast, Peach Springs, Arizona". Color printed postcard. Published by D. T. Mallonee, Phoenix, Arizona, for Peach Springs Trading Post. Printed by C. T. Co., Chicago. Number 111218. Postmarked 1927. 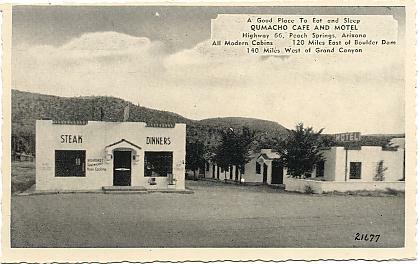 "Qumacho Cafe and Motel. Highway 66, Peach Springs, Arizona. ...". Black & white chrome-style printed postcard. Published by Kaeser & Blair, Cincinnati, Ohio. Number 21677. Unused. Circa 1940s. "How! 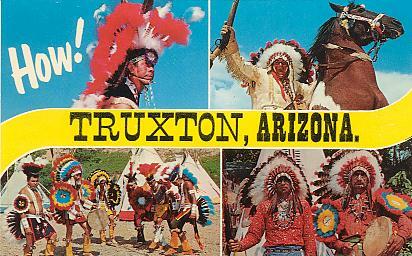 Truxton, Arizona". Color chrome-style printed postcard. Published by Dexter Press, West Nyack, N. Y. Number DR-99077-B. Unused. Circa 1960s. 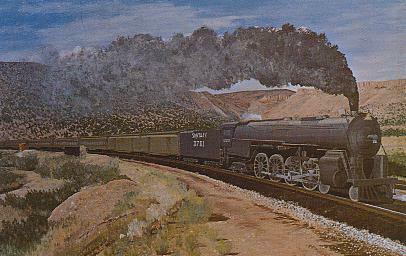 "...depicts last scheduled steam passenger train entering Truxton Canyon, Arizona. ...". Color chrome-style printed postcard. Published by Topaz Publishing. Unused. Circa late 1960s. 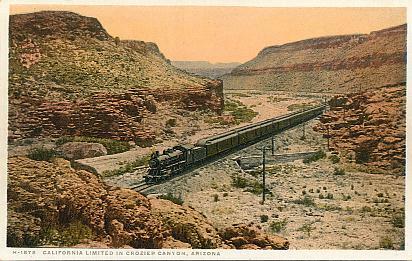 "California Limited in Crozier Canyon, Arizona. ...". Color printed postcard. Published by Fred Harvey. Printed by Detroit Publishing Co. Number H-1575. Unused. Circa 1920s. 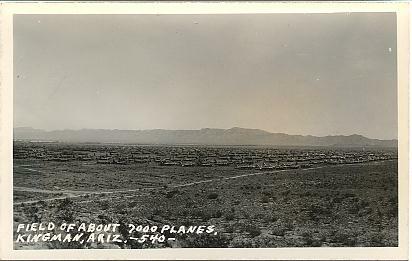 "Field of about 7000 planes. 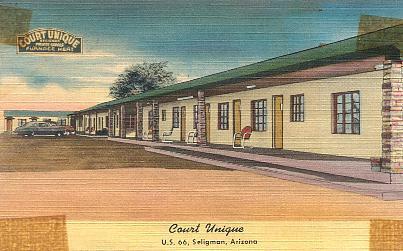 Kingman, Ariz.". Real photo postcard. Publisher not given. Number 540. Unused. Circa 1940s. 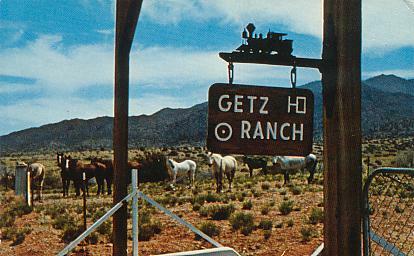 "Getz Ranch. Kingman, Arizona". Color chrome-style printed postcard. Published by Allan Dale, Lake Geneva, Wisconsin. Printed by Johnson Printing, Eau Claire, Wisconsin. Number J636. Unused. Circa 1950s. [This is about 7 miles east of U. S. 66 and may be seen in the distance from Hwy. 66]. 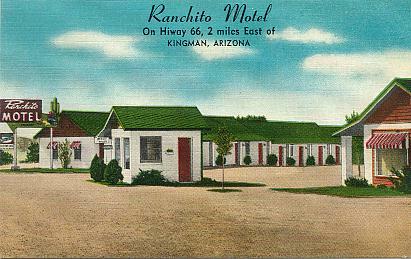 "Ranchito Motel. On Hiway 66, 2 miles east of Kingman, Arizona. ...". Color linen-texture printed postcard. Published by Associated Litho, Des Moines, Iowa. Number 24AT56. Unused. Circa 1940s.